Home » Free Recharge » Free 50 Rs. recharge using Freecharge Android App. Free 50 Rs. recharge using Freecharge Android App. 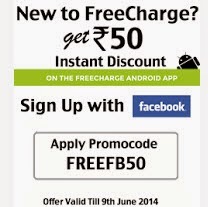 Freecharge offering Free Rs.50 Mobile Recharge, Just sign up using Facebook option on Freecharge app and get free Rs. 50 mobile recharge. Valid till 9th June 2014. Note: Only applied on first transaction. If you want multiple recharges, just create multiple Facebook accounts and apply coupon through it.